Have you ever seen anything like that before today? 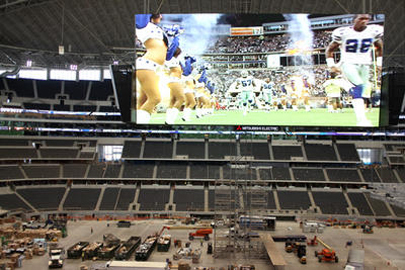 That Mitsubishi 1080p HDTV is the world’s largest HDTV, and it’s sitting right here in our backyard of Arlington, TX. I guess the old cliché is actually true: Everything is bigger in Texas. I don’t know about you, but I think that TV is amazingly awesome. 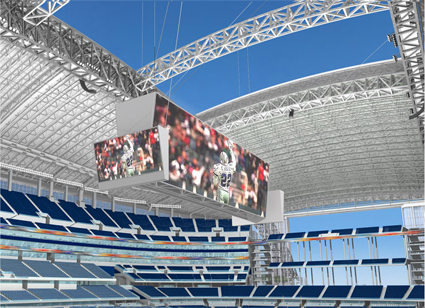 It looks like the entire display stretches from one 20 yard line to the other 20 yard line. Goodness. And you know that some drunk girl from the Mid Cities is totally going to take her top off and be seen on that display. And then we’ll really see how everything is bigger in Texas! Laters.